Manchester United will have to shatter their transfer record if they fancy signing Lazio star Sergej Milinkovic-Savic. Jose Mourinho is on the lookout for a long-term replacement for Michael Carrick, who is hanging his boots up at the end of the season. Moreover, Paul Pogba and Nemanja Matic also seem to be in need of a midfield partner. The additional gap left by Marouane Fellaini, who will likely depart Old Trafford at in the summer, is also a concern for the gaffer. However, United are already on the case, and have come up with some names to fill in that missing link in midfield. The Lazio midfielder seems to be one of the top players on that list. Unfortunately, according to Italian news outlet Corriere dello Sport, Lazio president, Lotito, has quoted a sum of €150 million for Milinkovic-Savic. It is said that he is aware of the inflated transfer market, and believes his player is worth that sum. 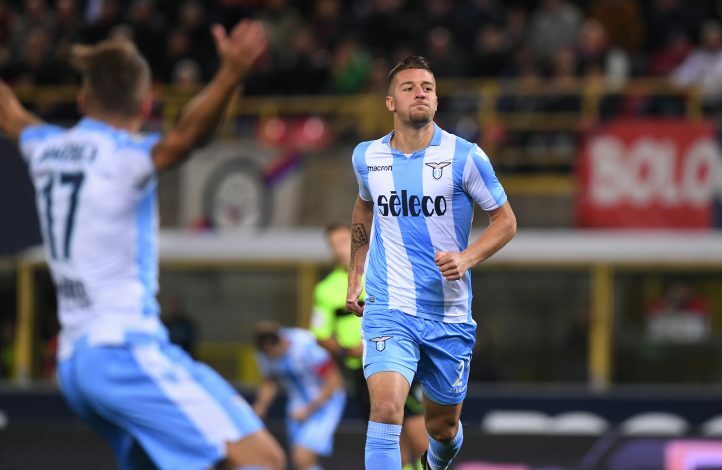 After confirming that a €70 million bid was rejected for the Serbian, Lotito seemingly intends to maintain his stance until an apt bid is made. The 23-year-old starlet, who has already established himself as one of the most prolific midfielders in Serie A, committed his future at the Stadio Olimpico till the year 2022 back in April 2017. Nevertheless, the fact that the Serbian international has a price tag implies that he is indeed up for sale under particular circumstances. And the Mancunian giants are known to create favourable circumstances when it comes to transfers.